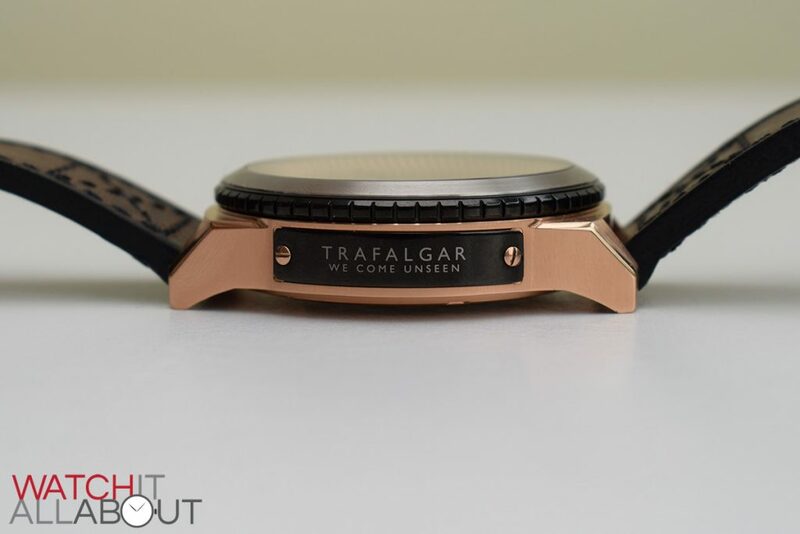 Published by Joshua Clare-Flagg on 14 Jun, 2016. 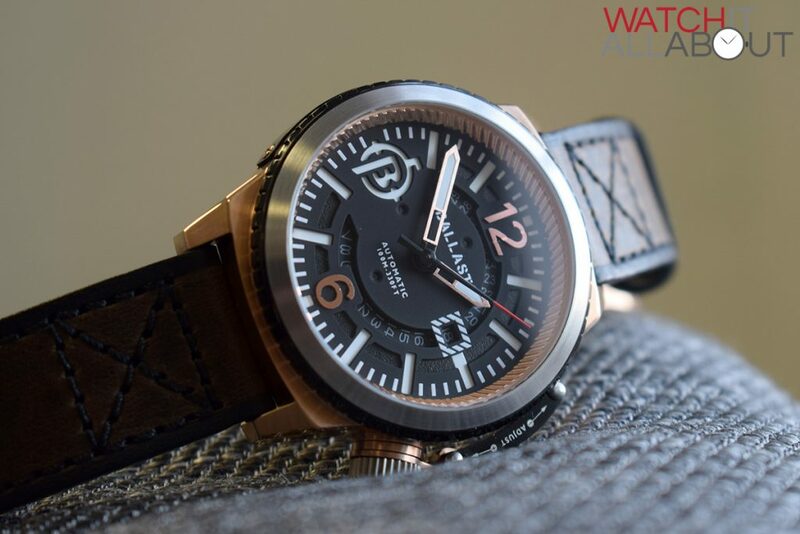 Ballast have been around for a little while now, and belong to the same family as Avi-8 and Thomas Earnshaw. 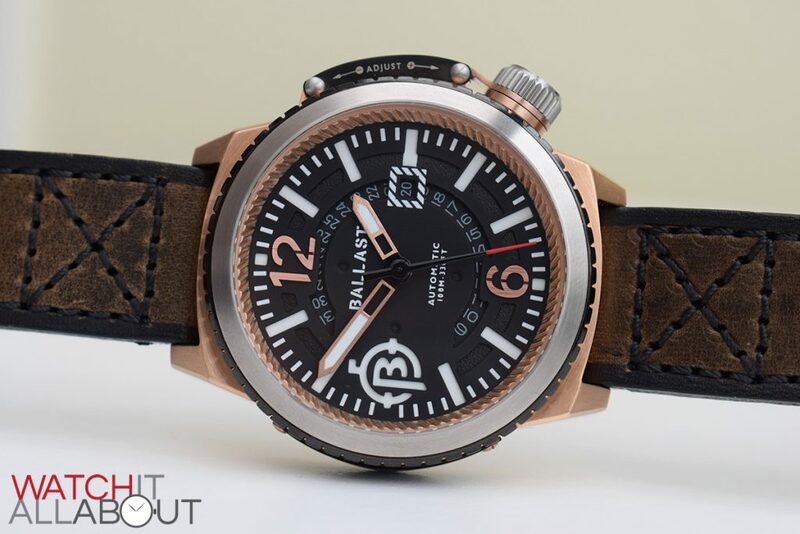 Ballast have a specific focus – that being marine. 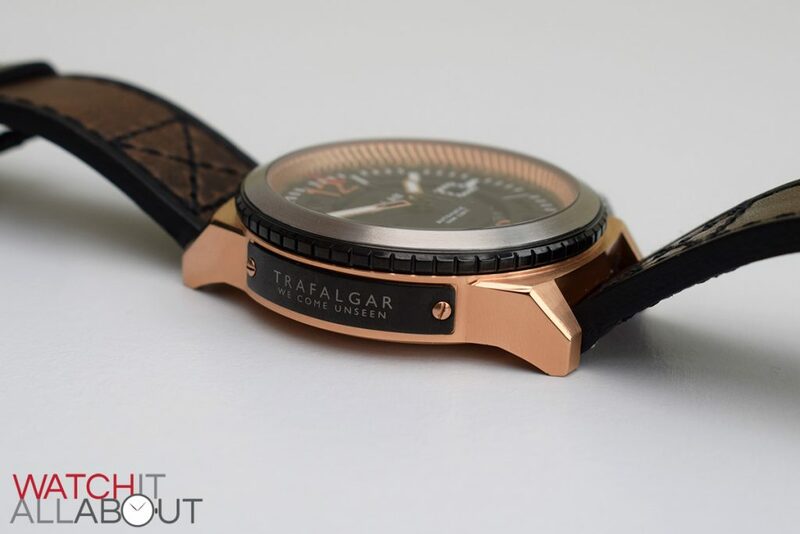 There’s no surprise then, that their latest and most interesting piece, the Trafalgar Valiant, is dedicated to the Royal Navy’s submarine force. It’ll cost you $499 / £345, which is a fair whack of money. But you’ll see that it’s a whole lot of whack of watch. 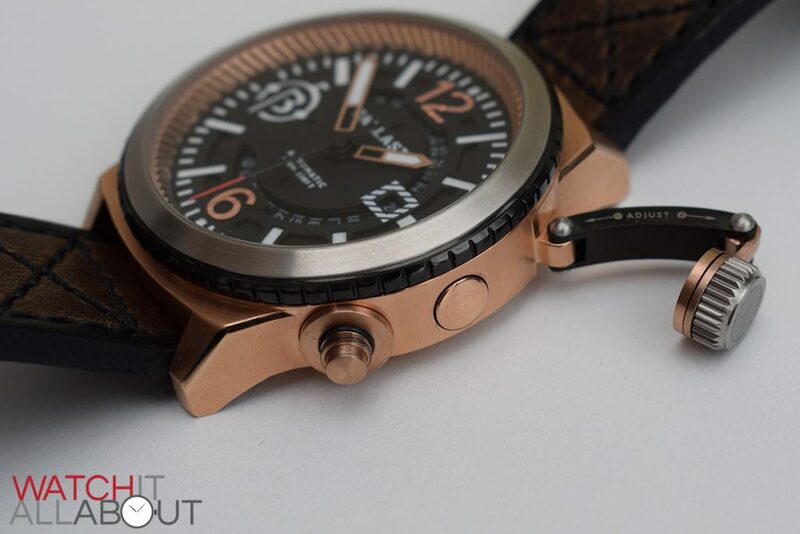 It also features a cool patented system that means you set the time and date using the bezel. So let’s take a closer look to see if it’s any good for the price. 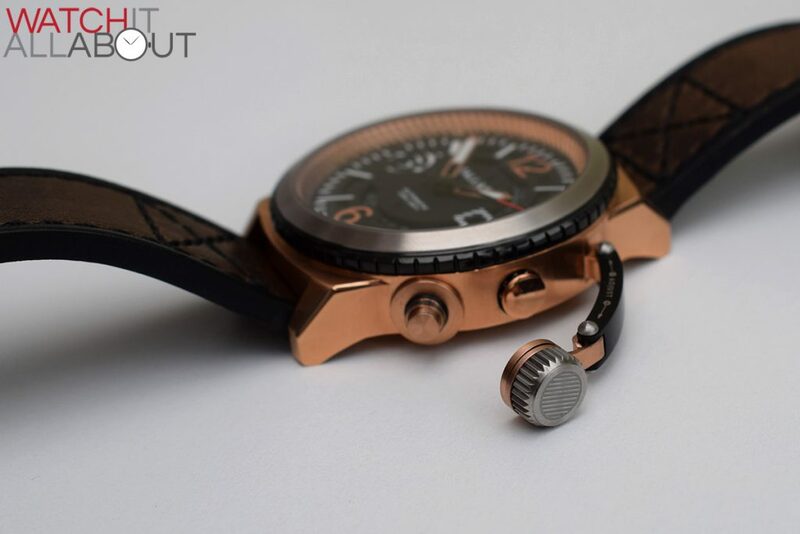 The case is large, over-engineered and has lots of features – the most noticeable is the canteen lock, made of 10 different pieces. 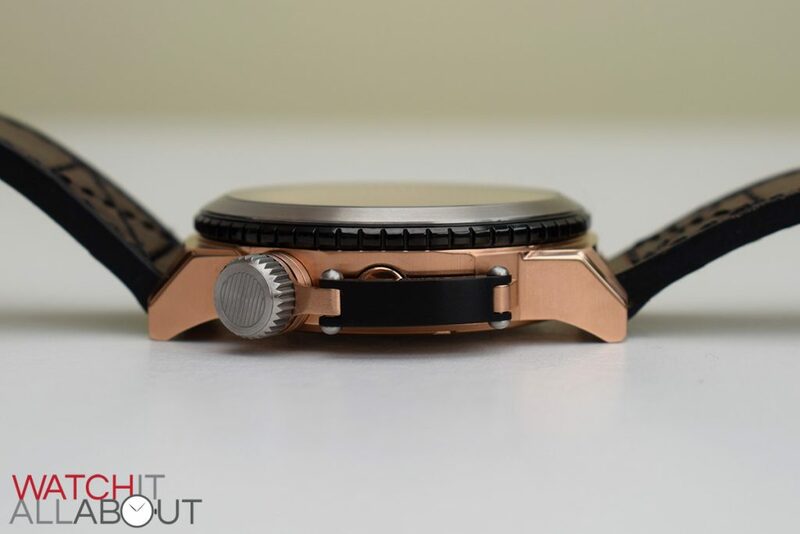 This hides the setting buttons – but more information on how that works in the movement section below. 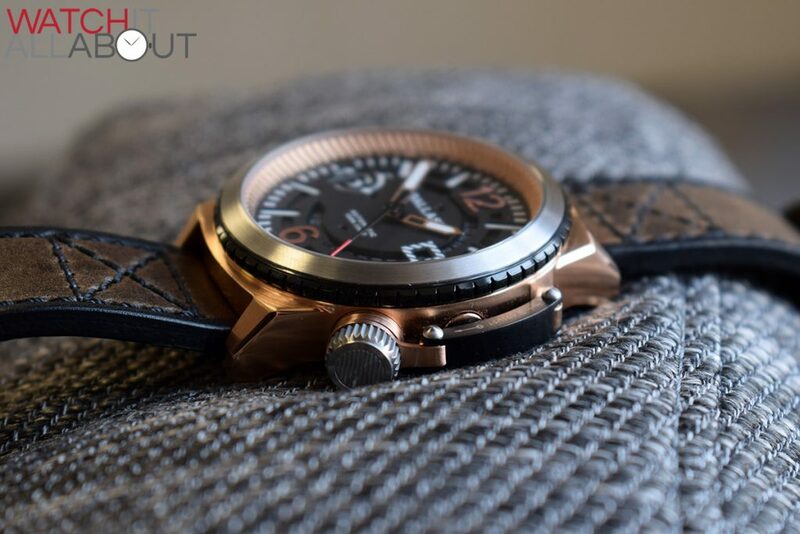 The case comes in a couple of finishes – namely standard stainless steel, a black IP coated, and this one – rose gold plated. 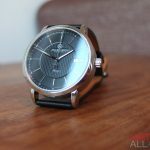 The finishing is all pretty reasonable – mainly brushed bar the polished top shoulders of the lugs. 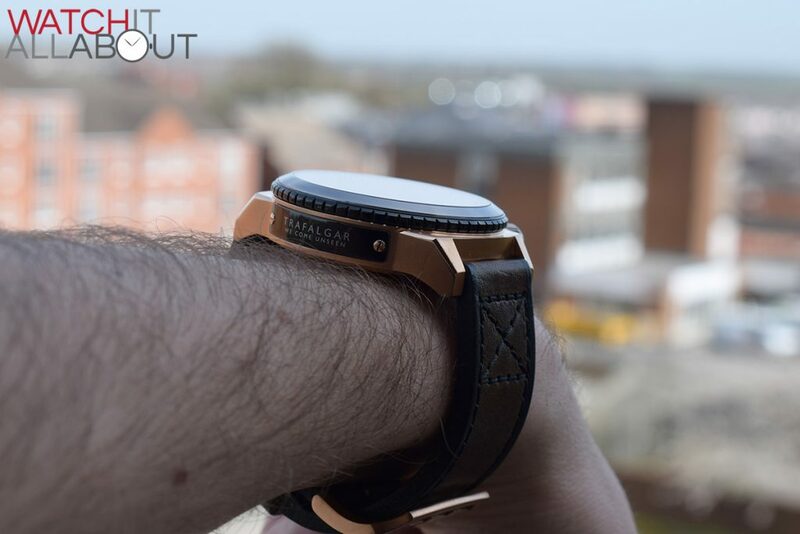 With a 46.5mm diameter it’s by no means a small watch – it also has a large height and lug to lug length. Surprisingly, though, it’s not as heavy as you might expect, which is good – so at least it keeps a measure of comfort. 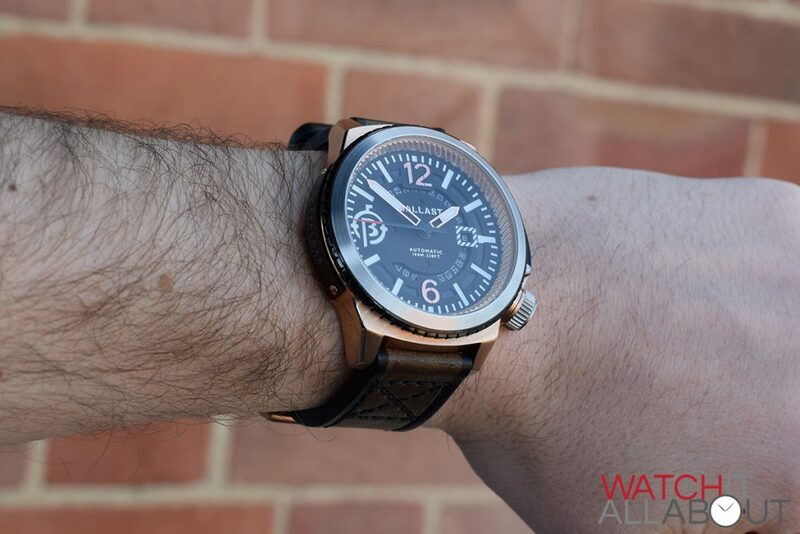 My wrist is 7.25″ for reference. There is a plaque on side with the Navy motto “we come unseen” – this is secured with screws. It is surprisingly well made and is a neat addition. 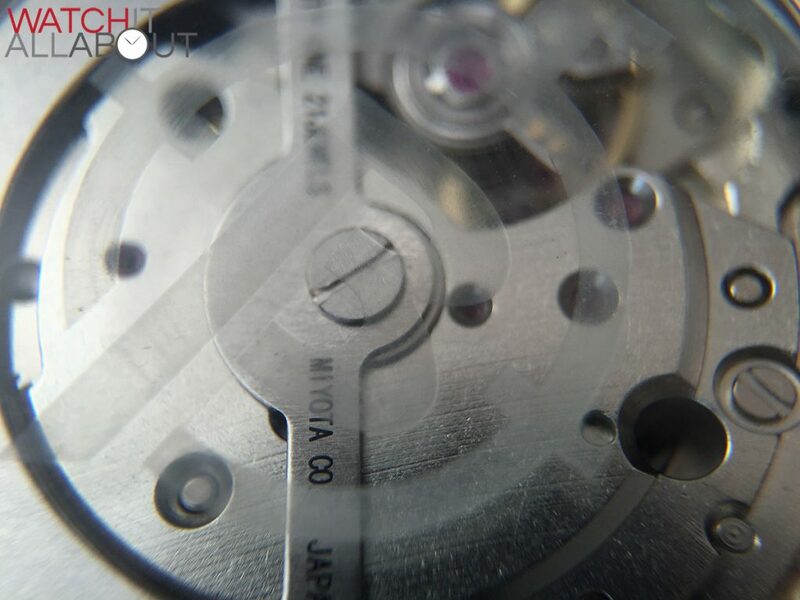 The rehaut / inner ring is stamped, polished and inlaid inside the case, again adding more detail. 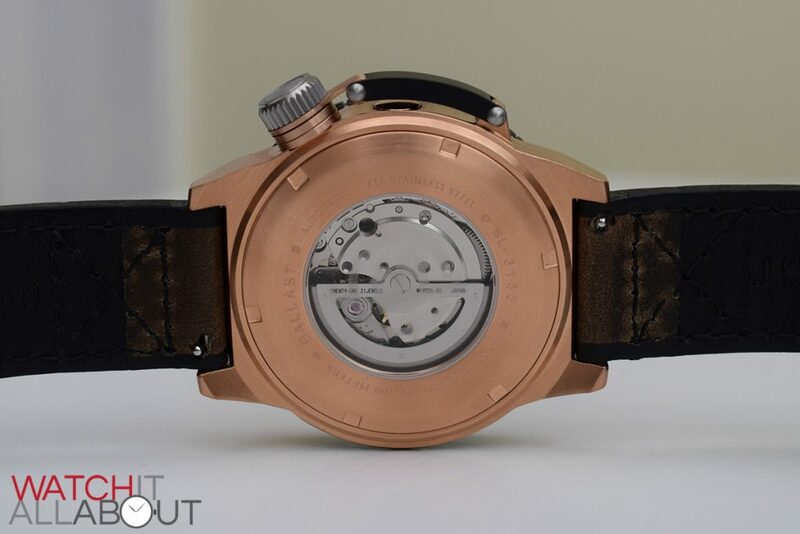 The caseback is a simple affair, with a exhibition window displaying the whole movement and details surrounding it. 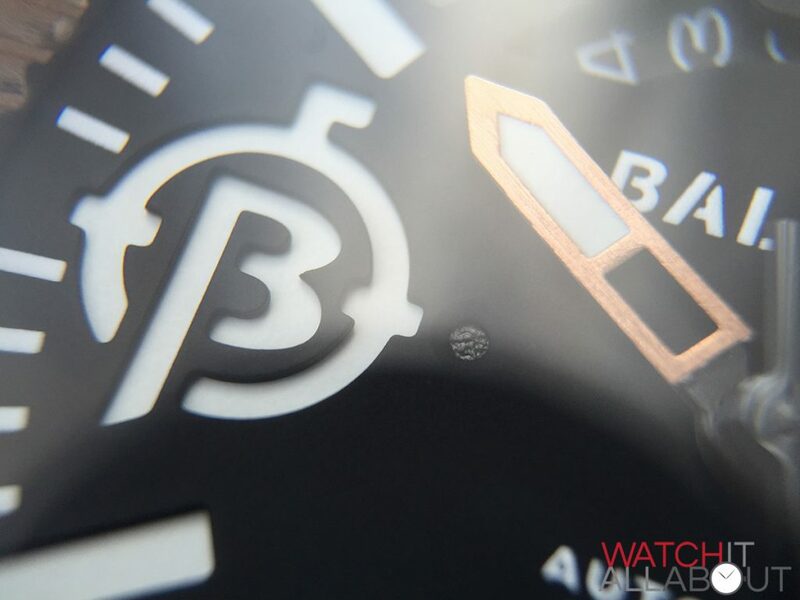 I think the glass is crystal (rather than sapphire) and features a subtle “B” logo laser etched on it. 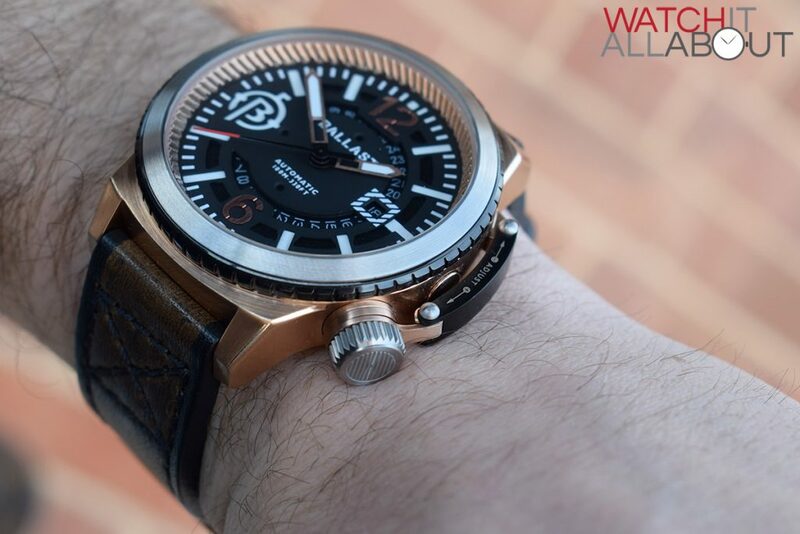 Just like the case, the dial is crammed full of intricacies. It’s multi-layered, with applied elements and cut-outs all over. The hour and minute skeletonised hands have a lumed filling and a brushed top, whilst the second hand is a straight point with a red tip. 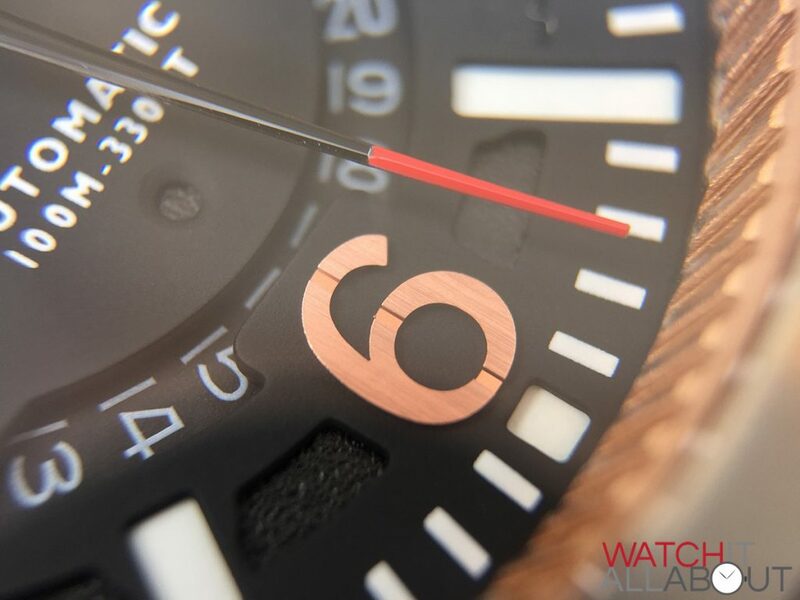 The dial is a multi-layered “sandwich” type, with a top level, a next step down which houses the lumed hour markers / minute track / B motif at 9, and then at an even lower level is the date wheel (which three quarters is visible). 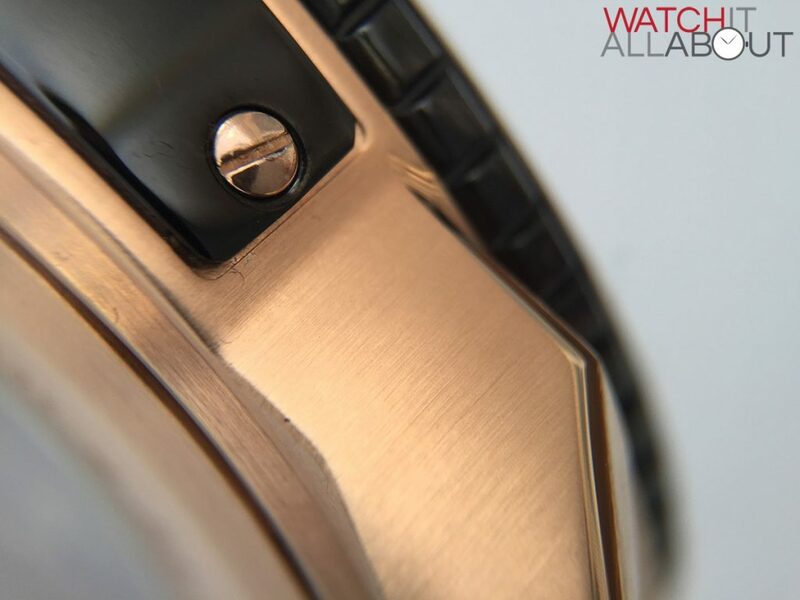 The applied 12 and 6 numerals are a brushed gold to match the case, and have a channel down the centre of the digit (think Hublot Big Bang). They’re really well made and applied – nice and thick and look quality. 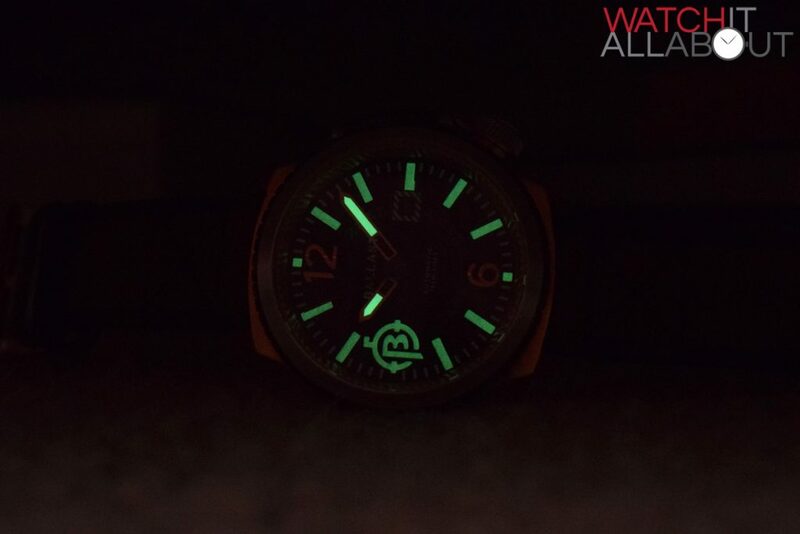 The lume is decent enough, and is great to see in the dark too, as there’s so much going on thanks to the B motif. 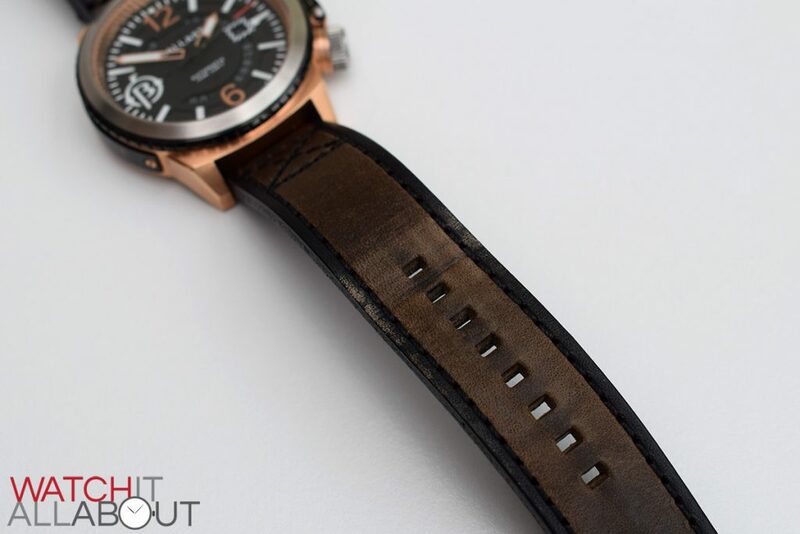 The two tone Buffalo hide leather strap is made from leathers tanned in Italy, and is pretty hefty to match the rest of the watch – it’s 4mm thick. 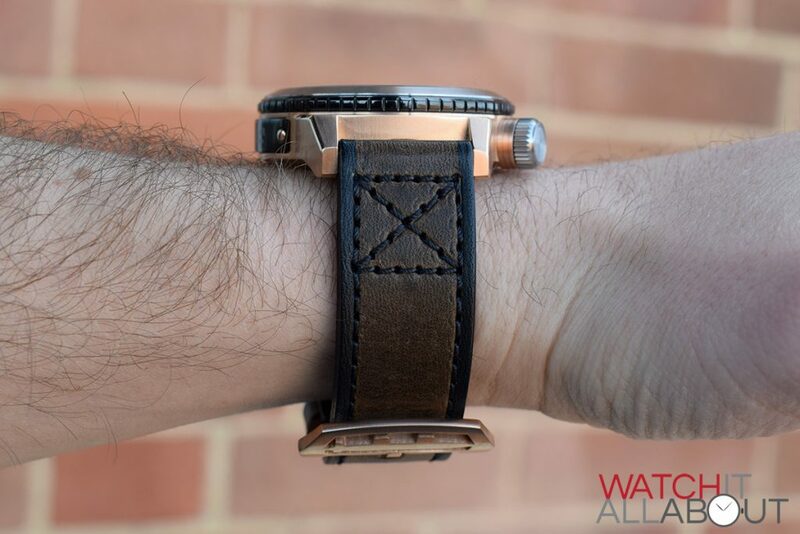 It’s also well made: it’s cross stitched by hand and features quick release pins – which I love and thick should be on more straps. 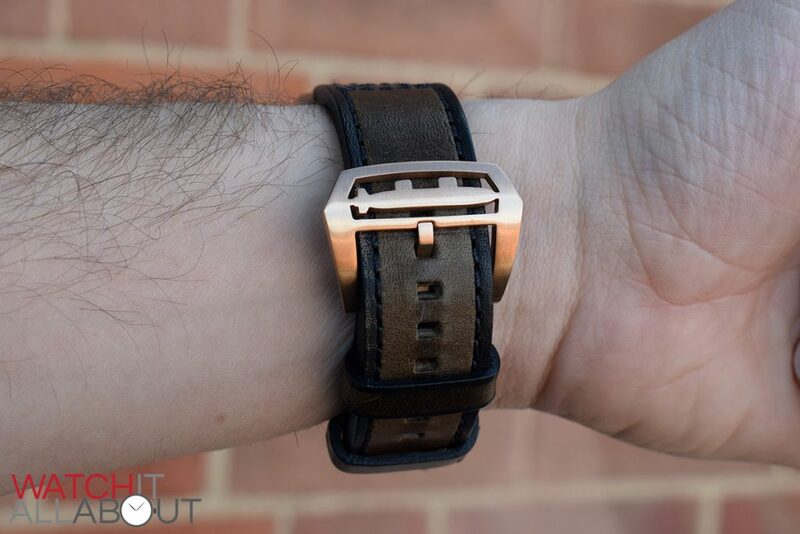 It features a huge buckle with a submarine punched through. 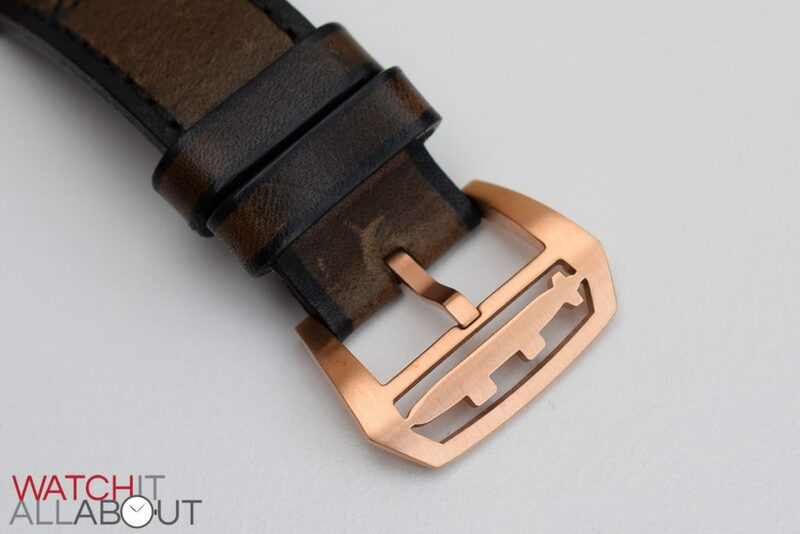 I don’t like it at all – personally I think a standard pre-V buckle would look great. But I see where they were coming from with the submarine tie. 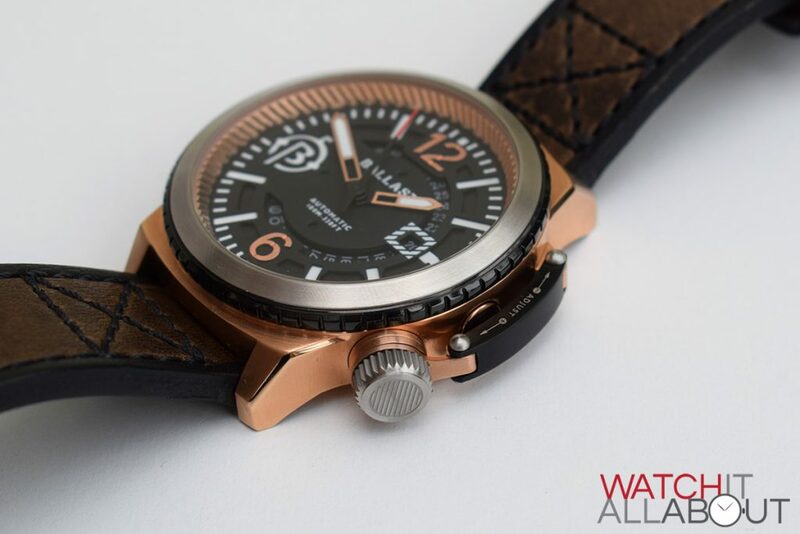 The movement powering the Trafalgar Valiant is a modified Miyota 8215 automatic. 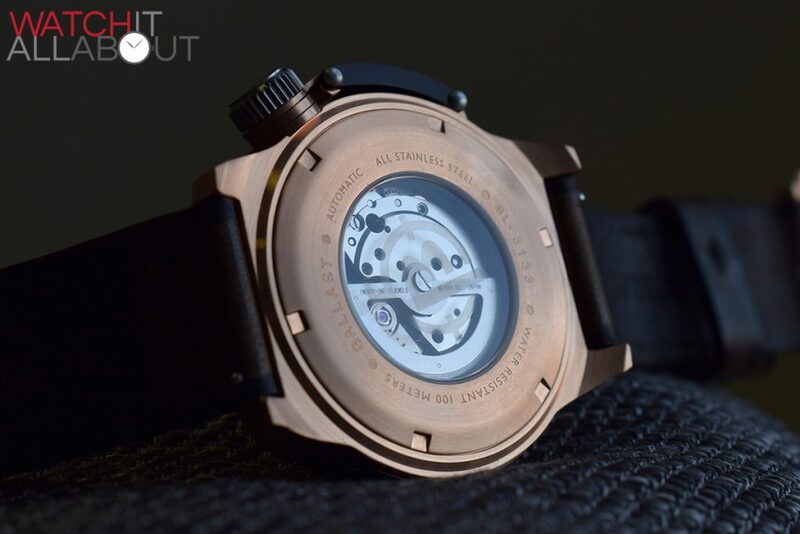 Specs include non hacking, 40 hours power reserve, 21 jewels, and uni-directional winding. It runs at 21.6k bph (6 ticks per second). 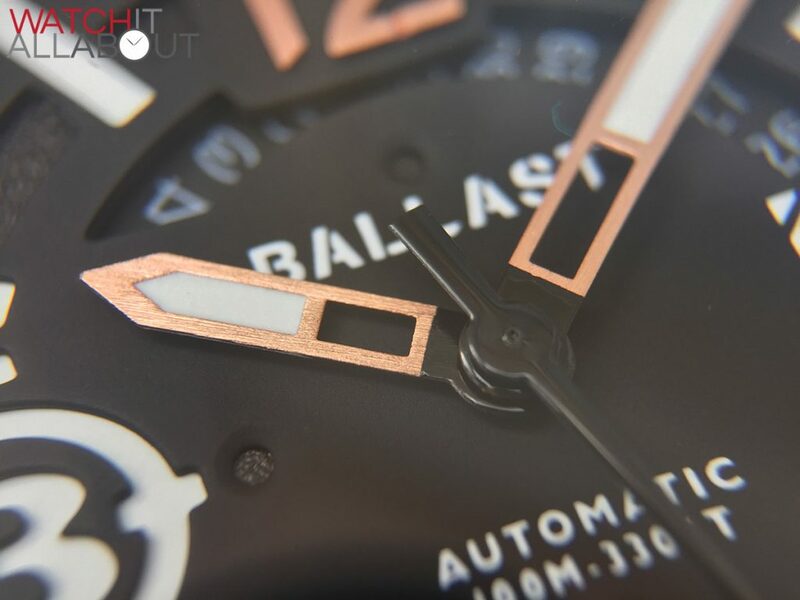 The movement is operated by Ballast’s patented bezel control system. View the video review to see it properly, but in essence you undo the canteen lock, and then push in the exposed pusher. There are two steps: one allows you to change the date, one for the time. When the pusher is in place, you simply move the rotor left or right to alter the time or date. It’s a cool system and is easy to use; however I’ve not found it mind blowing or life changing. It’s more of a gimmick than a revolution. 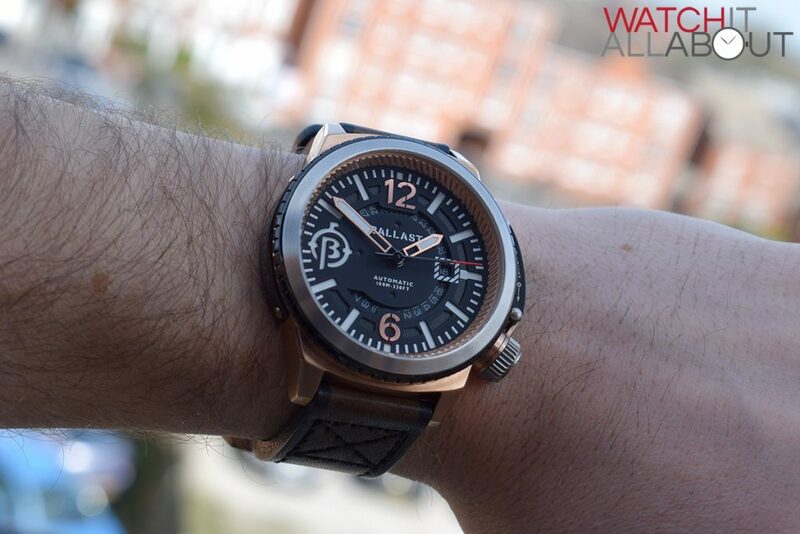 There’s no doubt about it, the Ballast Trafalgar Valiant is certainly a lot of watch. 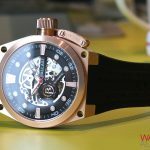 I think the look and feel of it will only appeal to specific people, but for those who appreciate a big, over-engineered and designed watch then it’s a good option. The price is probably a tad too high for my liking at the moment, but the amount of features it offers is still impressive. I hope in the future the price will drop a little – and then it’ll be a great buy. I’m afraid I’m not one of those specific people, that you mention that this appeals too. 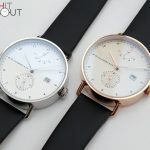 Thomas Earnshaw the brand has nothing to do with the 18-19C watch maker Thomas Earnshaw, its bogus brand heredity. 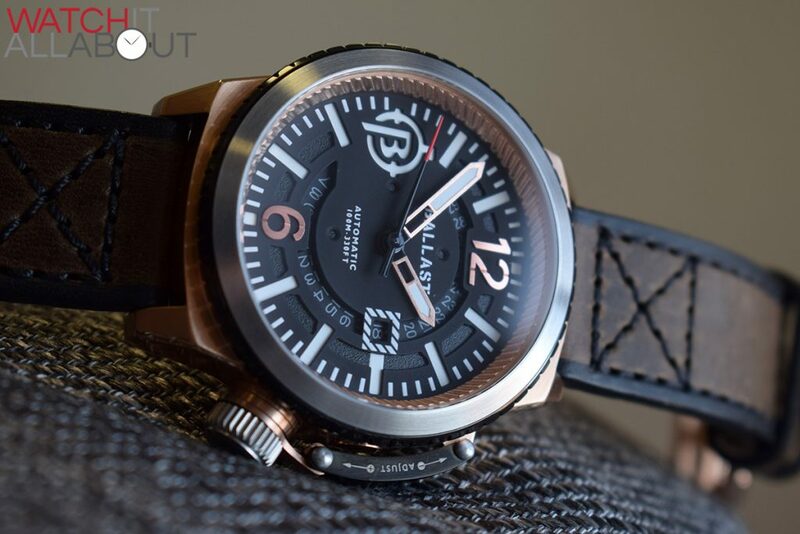 Same with this watch and its claim on the Royal Navy, (I believe that when the armed services do issue a watch it tends to be a CWC). 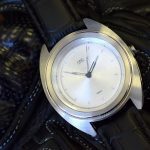 Its a very big, overly fussy, with a complicated dial, and gimmicky crown system. 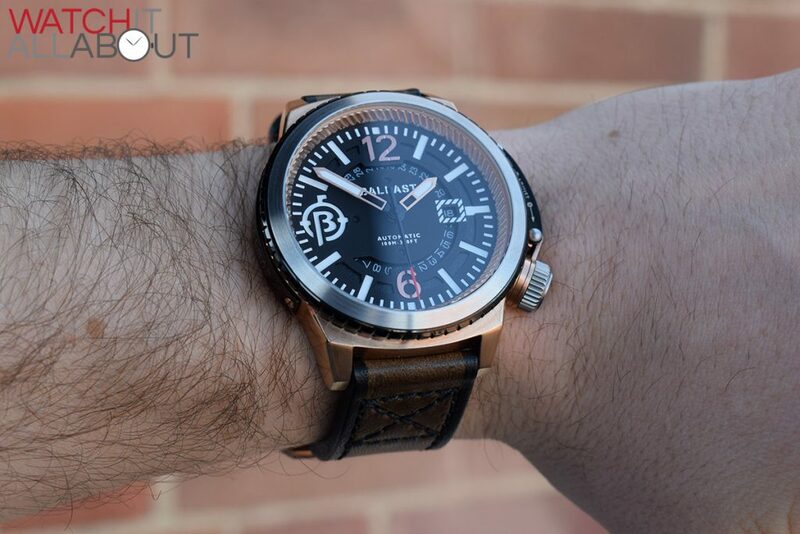 It will appeal to the false history brand crowd, like Avi-8 bears as much relation to the RAF as this does to the navy. 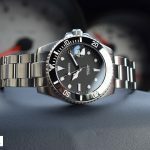 Or to people who buy a watch purely on humungous wrist presence and complicated/’clever’ looking features, eg Diesel. 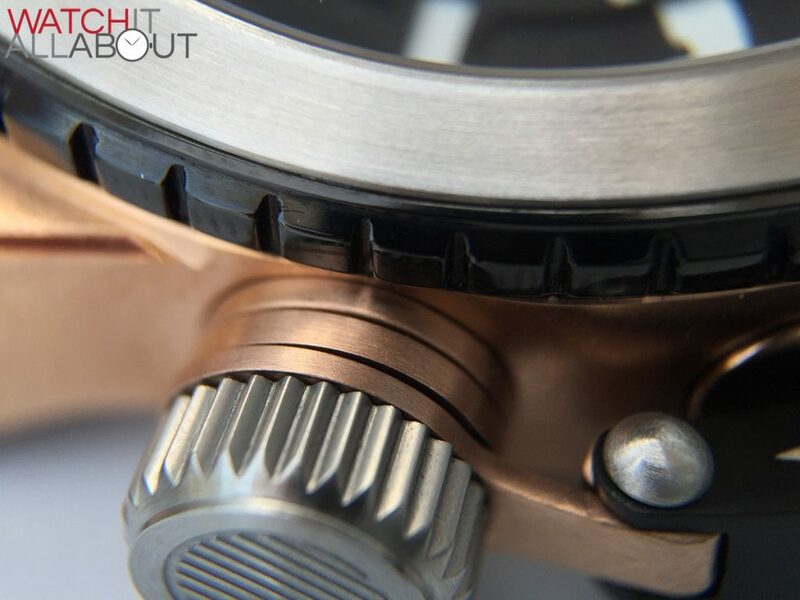 On a positive note its a miyota, so should be reliable assuming the movement has been married to the case properly. This is only my Two Cents worth and my entirely subjective opinion, there will be people who love it, and that’s great, truely, because there’s enough room for everyone too like what they want. 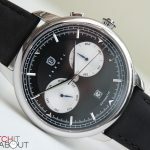 ( I’m also not being snobby against mushroom brands of indeterminate origin, for example, I loved the Rider GT&FQ/ sea-gull Chinese watch, reviewed recently, and am ordering the no-date version).